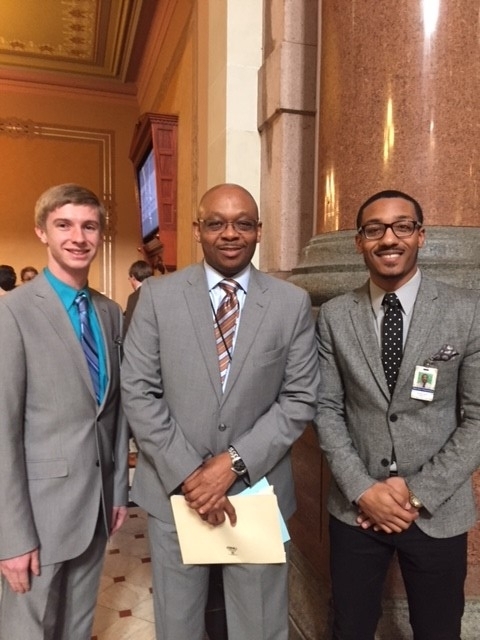 CARBONDALE, Ill. — Michael Smith and Darrin Reinhardt received the Southern Illinois University Carbondale Paul Simon Public Policy Institute’s 2018 Eugene Callahan Internship. Smith and Reinhardt, who are seniors, are working as interns with the Illinois House Democrat staff this semester at the Illinois State Capitol in Springfield. Smith, of Chicago, is majoring in political science with a minor in psychology. Reinhardt, of Alhambra, is majoring in agribusiness economics and history. Both are actively involved outside of the classroom. Smith previously served on the Black Male Roundtable and in an internship with the Chicago City Council. He is interested in public service and is considering a public sector career. Reinhardt, meanwhile, has experience in agricultural from working on his family-owned farm. He also worked at the Collegiate Farm Bureau as a government affairs representative and plans to pursue a career working on agriculture policy at the state and local level. Linda Baker, a university professor with the institute and long-time public policy and legislative consultant, former secretary of the Department of Human Services and director of the Department of Employment Security, mentors the interns and helps supervise their activities in Springfield. “The Internship provides students with a great opportunity to gain college credit as well as experience in the legislative process and important networking opportunities. I look forward to seeing them make a significant contribution in the future,” she said. The institute established the scholarship, renamed the Gene Callahan Scholarship in early 2015, to honor the late Gene Callahan, who passed away in 2014. Callahan, a longtime aide to Paul Simon and former U.S. Sen. Alan Dixon, was a member of the SIU Board of Trustees and a founding member of the institute’s board of counselors. His son, the late Dan Callahan, was head baseball coach at SIU Carbondale and his daughter, U.S. Rep. Cheri Bustos, D-East Moline, is serving her third term. Jerry Mileur, who served with Callahan on the institute’s board of counselors, supported the internship with a gift, and the internship replaced one named for Mileur, a Murphysboro native and a two-degree SIU alumnus. Mileur also endowed the Morton-Kenney Public Affairs Lecture Series at SIU Carbondale. Mileur, a retired chairman of the political science department at the University of Massachusetts-Amherst, died in September 2017. The scholarship sends at least one student to Springfield each spring to gain experience working in state government. Priority is given to students who are majoring in political science, history and journalism. Students work with members of the state legislature, statewide offices or state executive agencies.